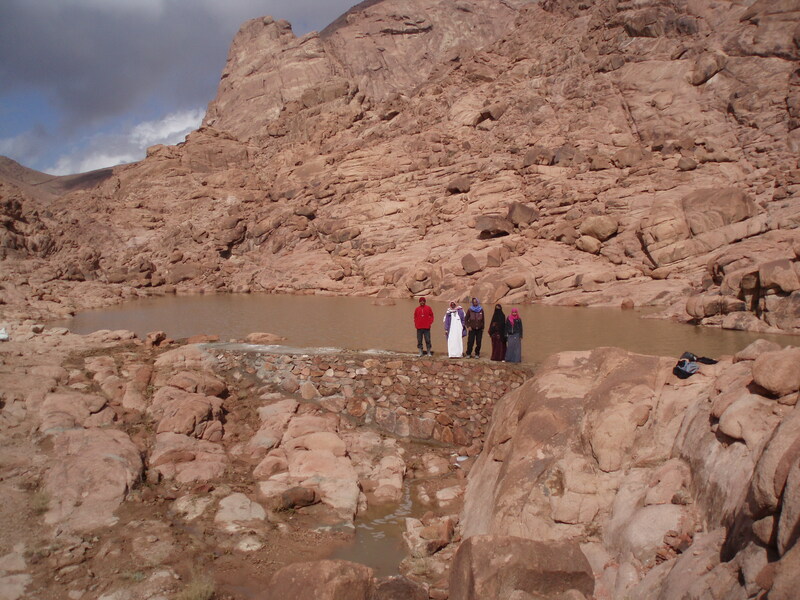 Hussein with his neighbours on Amria's Dam just after the first rain filled it. On April 24 there is a collaborative journey to build a dam between Green and Away volunteers and SKGR (Self Knowledge Global Responsibility). This is the next Makhad Trust journey to Sinai and we will be building the 12th dam in the mountains around St Katherines. Last March I led a party of school children from King Ethelbert’s School in Kent to build Spayiers dam and while I was there, one of the Bedouin came to talk to me about the dams. He said that the dams were making the most difference to the most number of bedouin and that their gardens were coming alive again with the increased water made available from the dams. Hussein had such a light of excitement, and passion in his eyes and his voice as he told me about his neighbours planting trees in their gardens again after they had been abandoned for nearly 10 years. Hussein inspired me to want to bring another party back this year to build another dam and now it is finally going to happen. 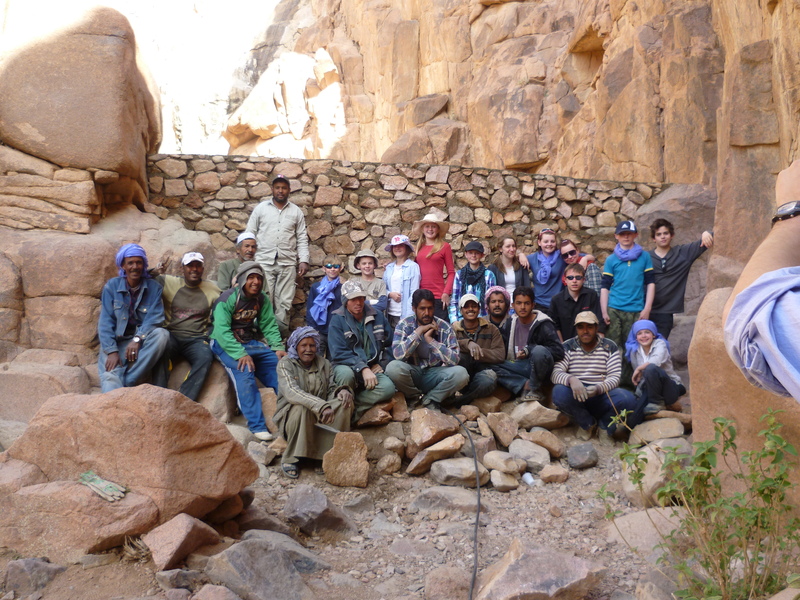 School children from King Ethelbert's School and local Bedouin last March after completing a dam. There is the little matter of raising the funds to build the dam first though. The dams are built high up in the mountains where there are no roads and all supplies including the cement have to go up the mountains on camels. This is expensive and with other building costs we have to raise £2000 to make the dam happen. I have opened a Just Giving web page for anyone who would like to donate. The dam we are going to build will help trap enough water to help at least 30 gardens further down the valley. Each garden provides food and an income to a family of 10 or more people, so that’s a lot of people who will benefit. exploring the desert and having a short retreat for those who would like to. The profound stillness of the desert enables a deep connection with self and with the earth and nature in a way we don’t often experience. 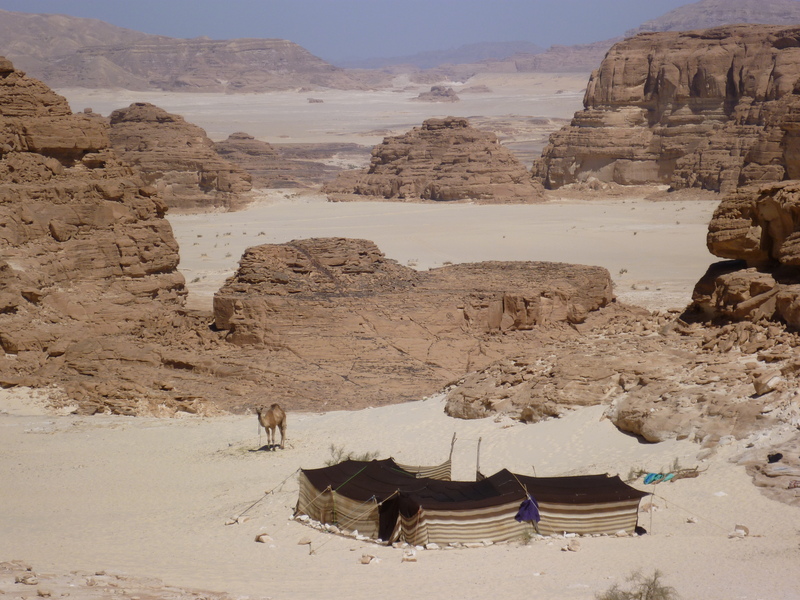 It is why a succession of desert hermits have lived in Sinai for centuries. It is also why we are running a Desert Retreat with Peter Owen Jones in October. There is more information about both journeys on the Makhad Trust website. This entry was posted in Green and Away, Makhad Trust and tagged Bedouin, Desert Retreat, desert silence, Journey, Sinai, SKGR, stillness. Bookmark the permalink.